In ten days we will be at the beach with my family! I love everything about the beach: the blue sky, listening to the waves, the sand between my toes, getting a tan, relaxing in a beautiful setting. The beach is such a perfect place. 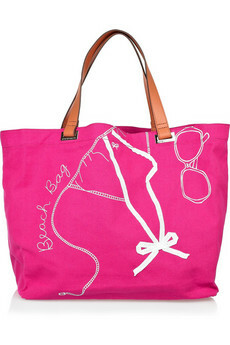 And there are so many fabulous beach accessories that I want to take with me. double-walled insulation so it keeps it extra cool. so you don't have to worry about sand sticking to it! Hats are so glamorous, don't you think? What's on your beach wish-list? So jealous! Have a blast and that water bottle is genius! I'll have to look for it at REI! I'm feeling totally envious of your upcoming beach trip!! I love all your beach picks :) I hope you have a great time! what a happy post! i love the water bottle...what a good idea!